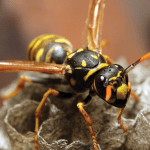 Yellow Jackets Nest Removal Long Island | EcoTech Pest Control Inc.
YELLOW JACKET is the common name for medium- to large-sized black and yellow wasps that construct uncovered nests that are made of a papery material. The nests consist of a single upside-down umbrella shaped honeycomb layer of “brood cells”, which are small octagon shaped compartments where eggs are placed to hatch and develop. YELLOW JACKETS will aggressively defend their nest if they feel threatened. Adults forage for nectar, their source of energy, and for caterpillars to feed the larvae (young). They hang their nests from a central stalk and spread a paper mache like mixture out into the shape of an upside-down umbrella. Plants, leaves and wood are chewed by the wasps, mixed with saliva, and churned into this paper mache like material that they use to construct the nest. The nests are constructed in protected places, such as under the eaves of buildings, in seldom used barbeques, in hollow PVC deck railings etc. Normally four to two dozen YELLOW JACKETS will be found on the nest. The colony begins in early spring, when the queens emerge from hibernation. Over the next few months, males and the next year’s queens are produced. These queens mate with males and are the only members of the colony to survive through winter. In late summer or fall, the original queen, the workers, and the males all die. The newly mated queens hibernate, typically in piles of wood, in vegetation, or in holes. The following spring they emerge and begin the cycle anew. A similar life cycle is found in bumble bees. YELLOW JACKETS CAN BE HIGHLY AGGRESSIVE. IT IS NOT RECOMMENDED THAT YOU TRY TO TREAT A YELLOW JACKET NEST WITHOUT PROPER TRAINING. A TRAINED ECOTECH TECHNICIAN CAN DESTROY AND REMOVE THE NEST WITH NO THREAT TO YOU OR YOUR LOVED ONES, AND WITHOUT EXPOSING YOU OR YOUR FAMILY TO HARMFUL CHEMICALS. CALL (631) 868-7023 TODAY TO SCHEDULE YOUR FREE INSPECTION.